When recently fired teacher, and alcoholic, Jack Torrance takes a job as caretaker of The Overlook Hotel, his family(wife Wendy and son Danny) must endure a winter of terrifying experiences. As the snow piles up, and the evil forces of the Overlook Hotel wage an assault on Jack’s sanity, Danny must tap into a gift he possesses (psychic abilities called The Shining) to survive. 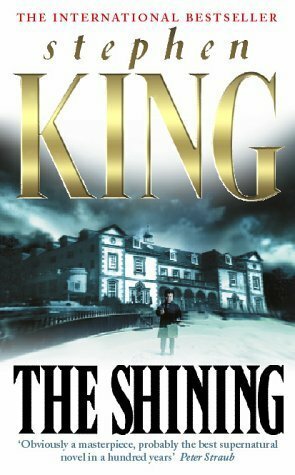 One of Stephen King’s best known books, The Shining is not just a ghost story, but functions as a meditation on alcoholism, family, and madness. This book really conveys the feeling of creeping insanity in wintery isolation, as well as the emotions of a young boy struggling to master a power he can barely understand. The reader gets a sense of how evil the Overlook Hotel is, by presenting glimpses of its long and terrible past. Even if you are familiar with the Stanley Kubrick film version, I recommend reading the book, as Kubrick changed and altered many things, and there will be surprises. I enjoyed this novel, and it probably makes one of the best entry points to the works of Stephen King, as many of its key images have seeped into the pop culture landscape as references (though largely as represented by the Kubrick Film). Film Version: Two actually. The more famous is The Shining (1980) directed by Stanley Kubrick, and starring Jack Nicholson and Shelly Duvall. A stark illustration of madness, the film illustrates Kubrick’s striking cinematography. The second is a television miniseries that aired on the SyFy Channel in 1997. Titled The Shining and directed by Mick Garris, it starred Steven Weber and Rebecca De Mornay as Jack and Wendy Torrence. The mini-series is a much closer adaption of the book, and was Stephen King’s attempt to correct what he viewed as the deficiencies of Kubrick’s version. Part of Series: Yes, there is a sequel entitled Dr. Sleep. Firestarter (1980) focuses on young girl dealing with destructive power. There is a film of the same name from 1984, and a sequel TV movie (Firestarter Rekindled) from 2002. Carrie (1974) uses psychic power as a metaphor for teenage angst and personal growth. There is a classic film (directed by Brian De Palma) of the same name from 1976, a television movie in 2002, and a big budget remake in 2013. There is also a sequel from 1999, The Rage: Carrie 2 that has tenuous connections to the original novel. John Farris’ The Fury (1976) tells the story of two psychic teens using their powers to help each other. There are two sequels; The Fury and the Terror (2001) and The Fury and the Power (2003). There is also a 1978 film version of The Fury directed by Bryan De Palma.